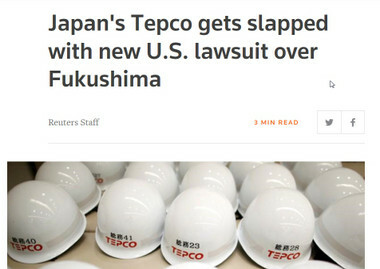 ・　Tokyo Electric Power Co Holdings said on Thursday it has been hit with another lawsuit filed in a U.S. court seeking $5 billion for compensation over the 2011 Fukushima nuclear disaster, the second filed against the utility in a U.S. court. The suit filed by 157 individuals is seeking that amount to set up a compensation fund for the costs of medical tests and treatment they say they need after efforts to support the recovery from the world's worst nuclear disaster since Chernobyl in 1986. ・　A multi-plaintiff lawsuit was filed on Aug. 18, 2017, against Tokyo Electric Power Co and other parties in the Southern District Court in California, the legal information group Justia said on its website.